Review Context: I’ve never played a game with a bard as the main protagonist. The most recent game I can think of that I played with many memorable characters and a story that connected to the player is Undertale. Few games leave a lasting impression on the player. 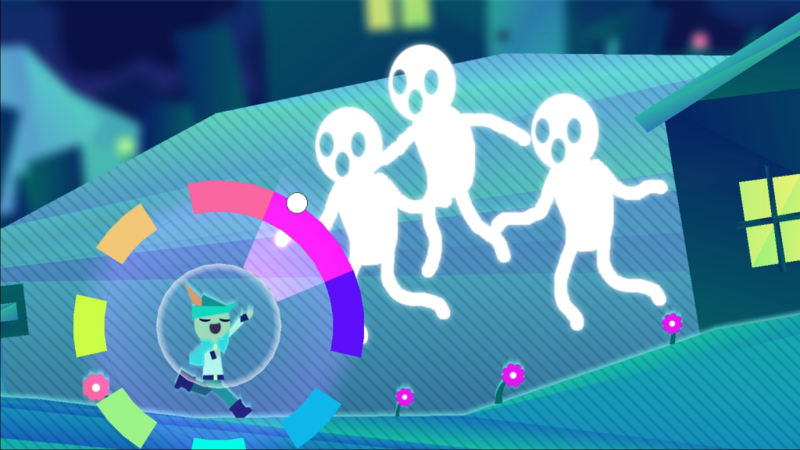 Even fewer games manage to do something that other games have not already done, but Wandersong, developed by Greg Lobanov, is a game different than mostly any other game I’ve ever played. How many games have you ever played as a bard, as a main character? 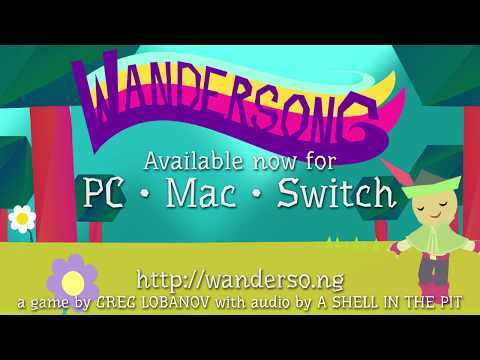 That’s where Wandersong comes in, a game about a wandering bard, tasked to prevent the end of the world by finding the different pieces of the Earthsong, that when sung prevents the end of the world. Wandersong doesn’t have a main character name for the bard, as you choose your name in the beginning of the game. Going into playing this game I was very skeptical about the mechanics of being a bard, but the gameplay for singing is rather easy, at least by using a controller (although you can use a keyboard/mouse setup). The way it works is you use the right analog stick to bring up a wheel of different colors, and while still up, pointing the analog stick in a specific color’s direction to make a singing sound. You can even hold the analog in a position for notes to be held longer. Each color has a different pitch, but I would say they don’t sound like a real human singing, but very close enough that it doesn’t really matter because the mechanic is still done very well enough to make it work. The game is separated by different acts, with each act having a different world of characters facing different challenges. As the wandering bard, you spend most of the time talking to different people, hearing their different challenges and issues and trying to solve them, while still trying to find different pieces of the Earthsong. Each act has an Overseer that can give you a piece of the Earthsong. Getting to the Overseer is the challenge in each act, as each act has different interesting qualities and tasks that set them apart from one another. 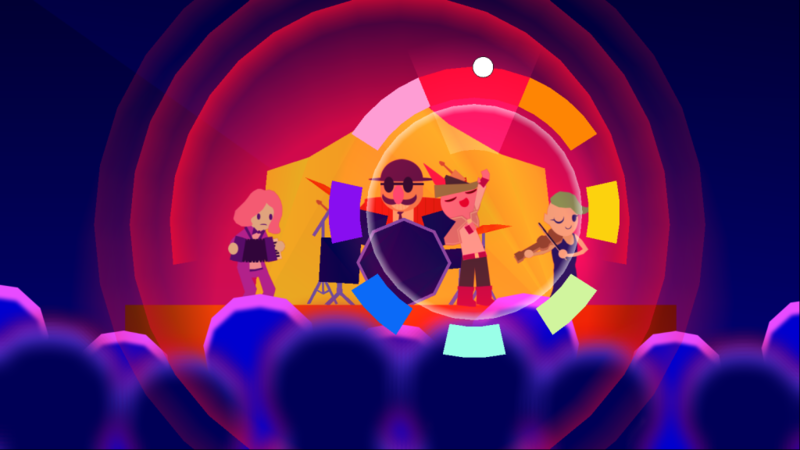 This needs to be emphasized, as one of the most impressive things about Wandersong is the huge array of characters across all of the acts, yet most of them are memorable, even if you only met them for a short period of time. Never did I feel the characters in the game were copy/pasted, as the characters across the game are all different with a range of personalities as they interact with you. There were some characters that I genuinely felt sorry for, a testament to the great writing in this game. There is plenty of dialogue in the game, as sometimes I felt like I was playing a point-and-click game, only dragging in some areas, but most of the dialogue is done very well that even I was enthralled and hanging on every word. The gameplay of within each act is what surprised me the most, as you use your bard singing to everything, literally. Each act is different, and in each act you find yourself using your singing to overcome obstacles in different ways. The coolest element of gameplay is rhythm, as you will reach “obstacles” (no spoilers) where you have to input notes in a specific order to move on, similarly to games like Guitar Hero or Rock Band. What makes Wandersong stand out so much is it brings this rhythm gameplay concept out and uses it in many different ways and directions that makes it feel unique to the game and concept as a whole. Under-promoted in Wandersong is its platforming, as there is a decent amount of platforming in the game using the singing mechanic, but the platforming in each act is very different, with some platforming using great physics, particularly near the end of the game. Most of the acts have some form of combat where you have to use singing, but combat is done differently in each act (mostly) and adds a different flavor each time. There are some puzzles in the game, but all fair, with one puzzle making me want to slap myself as it took longer for me to get than it should have. I did run into one rhythm puzzle bug issue at the end of Act 4 that halted my playthrough (why this review is late), but a recent patch seemed to fix it, as I was gladly able to finish this game. The gameplay and musical elements are the major takeaways of Wandersong, but the graphics and level design should not overlooked either. The game is incredibly colorful, with each act having its own look and design. The level design, to me, is some of the best I’ve ever played in a 2D game, as the levels are layered seamlessly. You can jump up and drop below different levels, so easily that it never felt clunky like other games I’ve played where you can drop down between platforms levels. In addition to the layered levels, the cinematic sequences in the game are so well done in the game, whether it be the increase in sound levels or great use of camera zoom. The cinematic sequences in Wandersong definitely put this game on a greater level for the experience and story being told. It should go without saying, but the soundtrack is really good, with many great songs providing good soul to each act, including many great songs in key parts of the story. As the story unfolds in each act you quickly realize you are experiencing a very special story. You are rooting for the bard to succeed and that is the greatest accomplishment developed by Greg Lobanov in Wandersong, creating a character from scratch that is root-able and means a lot. There are several main characters in the story that are very well developed, each providing great value to the overall storytelling, including the emergence of a “rival” (not going to spoil). Without spoiling, I was very pleased by the ending, as it was an ending that fit very well. Even better, is a great epilogue sequence, which adds even more to the storytelling of the entire game. As much as I would love to tell you all the great moments in Wandersong, I would rather you just play it for yourself. I had minimal expectations going into playing Wandersong, but it took me for a great ride that I will remember for a long time. Wandersong is the total package of a game that should be played by everyone, and I can safely say this is a solid contender for my favorite game of 2018.